FORESTBURGH, NY (August 15, 2015) – A simple and efficient journey on Google Maps will demonstrate a 96 mile separation between the Winter Garden Theatre on Broadway and the Forestburgh Playhouse in Western Sullivan County. Ladies and gentlemen take note! The gap is gone. The Broadway Musical of all musicals is alive and kicking (pun intended) on the main stage at the Forestburgh Playhouse. Yes, there are miracles in the forest and spectacles on stage, but this production of 42nd Street is an unadulterated reflection of hard work, inspiration, abundant perspiration and the theatrical savvy of Producer Franklin Trapp, director/choreographer Robin Levine and Musical Director Henry Lewis. The stage at Forestburgh is proscenium with a main curtain that flies. This versatile feature is utilized effectively, for after what seemed to be an exceptionally lengthy Overture, it slowly rises, stops and dramatically reveals forty from-the-knee-down legs with tapping feet in constant motion. Anticipation for what is to follow is clearly established by this clever piece of theatrical insight. The main curtain then rises fully to begin an exceptionally smooth, proficient, and entertaining evening of showmanship through the art of dance. Holding the sequence of events on a level plane is the assignment of Mark Hardy, a Forestburgh veteran. As Julian Marsh, he consistently provides a credible portrayal of the tough stage director who falls in love with a girl from the chorus. 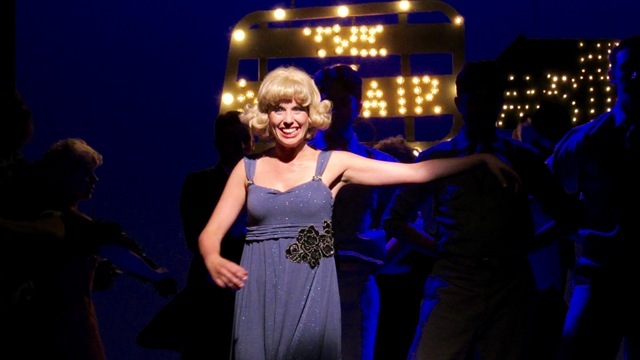 Julie Kavanagh brilliantly brings that girl from the chorus to life as an extremely talented, yet naive, Peggy Sawyer, “just off the bus from Allentown, Pennsylvania.” A new comer to New York she aspires to become a dancer: a dancer under the big lights of Broadway. As the complication begins, she’s off on the wrong foot and late for her first audition. Also, Kim Harris as an actor and vocalist, forcefully demonstrates her ability to portray the fading star, Dorothy Brock. Dorothy‘s not over the hill, but she is aware of her quickly fading talents and compromises her personal relationships to chart and secure her future. Costume Designer Genevieve V. Beller has created an enormous number of attractive and efficient costumes for a production that requires an exceptional abundance of costumes and subsequent quick changes. Some seem to be measured by nanoseconds. One actor commented: “In between scenes there are just baskets overflowing with costume changes.” Oh my, but it all works! Scenic Design by Bradley Wherle was frequently over the top with creativity and practicality. For example, in the “We’re in the money” scene, featuring the ResCo chorus et al., what appeared to be the design of winged Mercury dimes was fabricated to create four-to-five foot diameter dance platforms. Very shrewd. Lighting Design by Michael O’Connor provided an effective overhead light center stage, while the implementation of lighting for shadow ballet requires additional attention. An element characteristic of the Forestburgh Playhouse that establishes its identity as a theatrical destination is the quality and consistency of its Resco. Members of this vibrant and talented group have provided an additional bonus to an evening of theatrical entertainment at the Playhouse. Its members are essentially the enthusiastic, energetic corps de ballet of this tap-your-feet musical. Further, opening night provided theatre goers with a full view of the enormous dancing talents of Alex Drost. This comes as little surprise to Forestburgh patrons. They’ve witnessed smidgens and tads of his talents through the season, but 42 Street is where this talented young actor shows it all. Further and on the list of returning ResCo talent is Abby Sierakowski in her part of Maggie Jones the Dance Captain in 42nd Street’s play within a play. 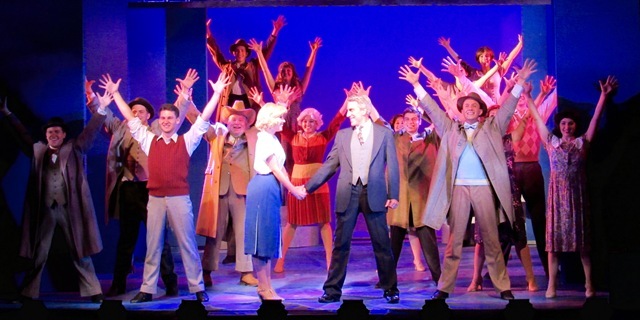 Abby insures the validity and success of the current 42nd Street production. She exhibits a vocal dexterity (range and force) and nimbleness of foot that enable her to legitimately hold the stage in the midst of competing action. In addition to the deserved and just accolades given to Trapp, Livine, Lewis above, a production of 42nd Street is a true memorial, a tribute to one of musical theatre’s most famed musical directors and choreographers, Gower Champion. As a Broadway director and choreographer he first claimed success with Bye Bye Birdie (1960), Carnival (1961), Hello Dolly (1964) and other successful productions. Gower Champion continued. In the summer of 1980, 42nd Street proved to be an assemblage of all his most successful and appealing techniques from musical theatre: an abundance of tap-dancing numbers, shadow ballet and dancers, dancers and more dancers. 42nd Street was Mr. Champion’s final show. The audience reportedly froze, numb, until Jerry Orbach, the first to gain his composure, called out forcefully, “Bring it down!” The curtain fell.